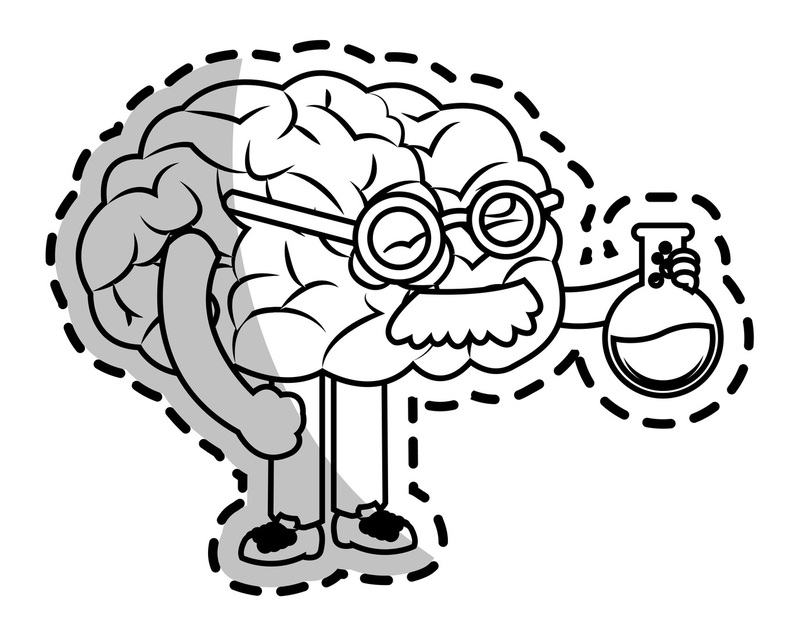 Here’s one for all you mindless dummies–a comparison review between two mindful nootropic: Mind Lab Pro and OptiMind. Looks like we’re dealing with a couple of plagiarists here. If I’m being honest, I don’t mind a little plagiarism in the world of nootropics, so long as the formula that’s being plagiarized is the better of the two. Between Mind Lab Pro and OptiMind, there’s no outright bad formula, which is awesome. Both of these stacks rank highly in my books. Yet, there’s definitely a better, more mindful formula here that, given its lack of proprietary blend obscurity, seems to be asking for plagiarism. Mind Lab Pro or OptiMind: Which is better? Mind Lab Pro on the left, OptiMind on the right. If appearances were everything, these formulas would be equally ranked. 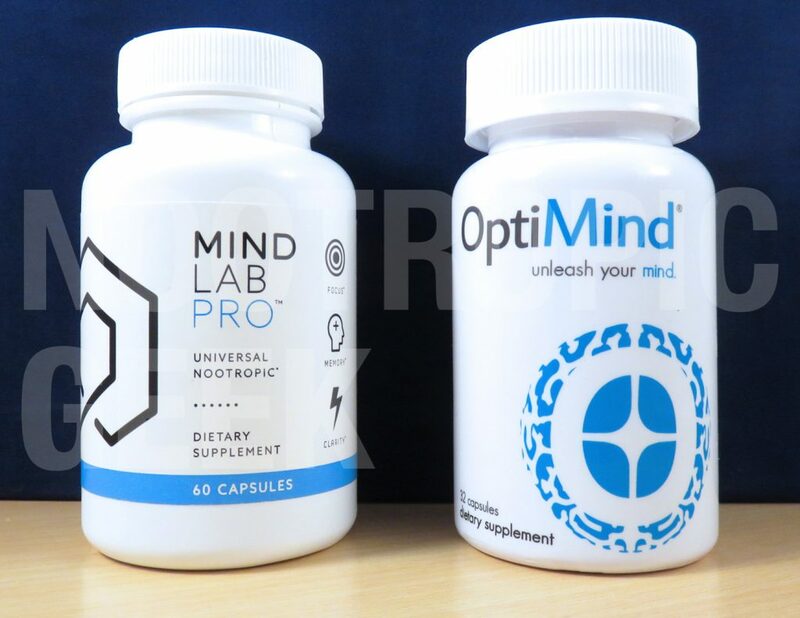 From their white + blue color schemes to their clean, pseudopharmaceutical tones, Mind Lab Pro & OptiMind could easily pass for each other if you swapped the names on their labels. If you’re going to take only one nootropic stack from now throughout the rest of your life, then you’ll want a product like Mind Lab Pro, the top ranked stack of my nootropic reviews. One reason for this, it has all of my favorite nootropics: Citicoline, Bacopa monnieri, Phosphatidylserine, L-Theanine, Vinpocetine… Even the Pterostilbene, Lion’s Mane, & Huperzine-A are exciting for their long-term benefits on brain health. As such, Mind Lab Pro is a multi-tasker in every sense of the word (words?). It effectively accomplishes so many various angles on brain health that I can’t imagine anyone who wouldn’t benefit from supplementing this stack. Read my in-depth review on Mind Lab Pro. While OptiMind covers much less ground than Mind Lab Pro, it isn’t entirely different than the formula–in fact, five nootropics are shared between the formulas: Tyrosine, Bacopa monnieri, Phosphatidylserine, Vinpocetine, & Huperzine-A. Due to this, OptiMind may support cognition via pathways outside of neurotransmitter support–yet, such a heavy portion of the formula focuses on brain chemicals to the point that I’d primarily consider OptiMind for its support of neurotransmitters. Plus what you won’t find in OptiMind are potent neuroprotectors such as Pterostilbene, giving the formula less of an edge in the category of brain health. As such, OptiMind is better for clearing brain fog of the here & now versus the later. Read my in-depth review on OptiMind. 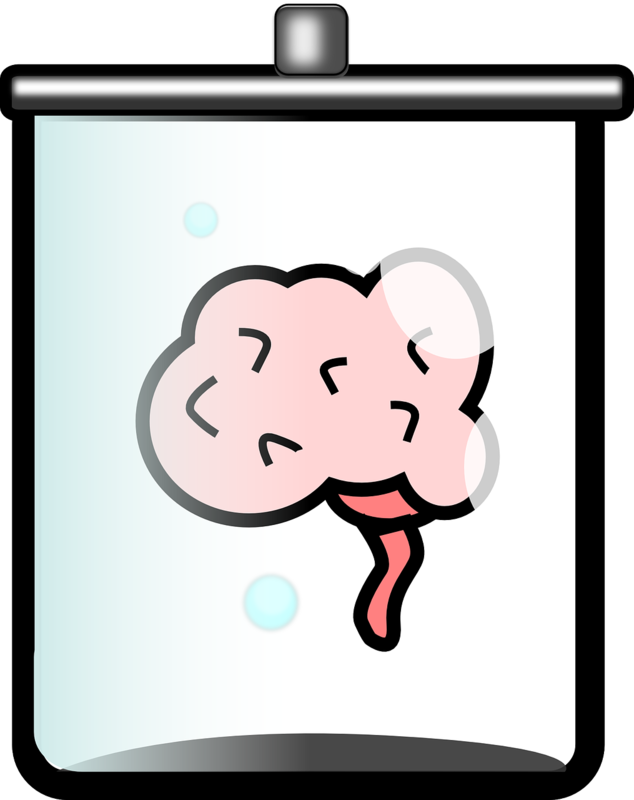 Cognizin® Citicoline: Quality, branded form of Citicoline, my preferred option for nootropic choline sources. Sold by prescription in many countries. Sharp-PS® Phosphatidylserine: Sunflower-derived PS, as opposed to soy-derived PS. Believed to be a more premium form of the awesome nootropic. N-Acetyl-L-Tyrosine: NALT is the better, more bio-available form of this stress-reducing amino acid compound. 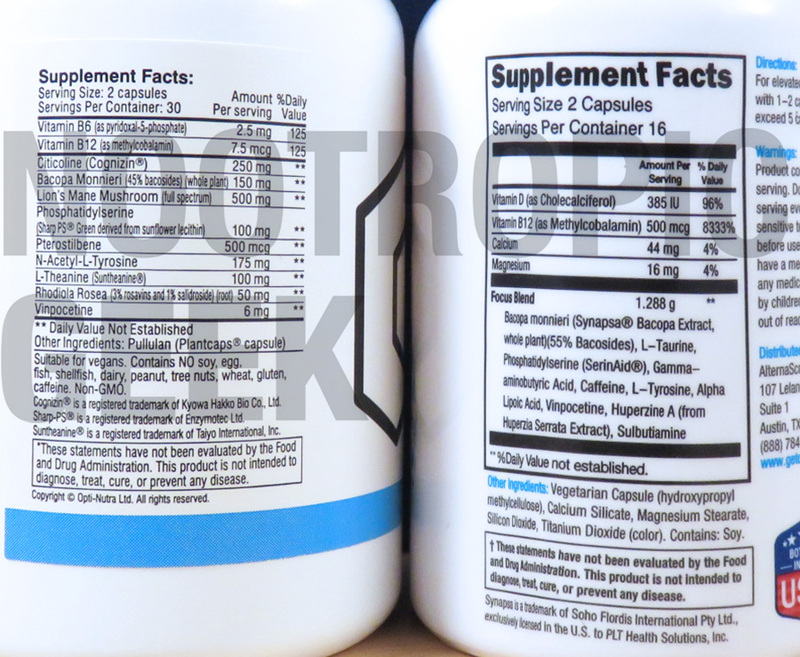 Vitamin B6 as P-5-P: Many supplements opt for the cheaper, weaker Pyridoxine HCl form, but Mind Lab Pro steps up their B vitamin game with “active” P-5-P.
Bacopa Monnieri (45% bacosides): Bacopa is one of my favorite nootropics, so I’m happy to see this memory-enhancing adaptogen at a quality 45% bacosides extract. SERINAID® PS: OptiMind also opts for higher quality, branded PS–however, bear in mind that this PS is soy-derived as opposed to Mind Lab Pro’s sunflower PS. Bacopa Monnieri (50% bacosides): This Bacopa is actually of a higher % standardization than the Bacopa provided in Mind Lab Pro’s formula. Vitamin D (as Cholecalciferol): It isn’t uncommon to see this high quality D3 form of Vitamin D, yet I’ll still give OptiMind props for using it. Caffeine: Is this how OptiMind clears the brain fog? By sneaking in the world’s favorite drug? Not a true nootropic, but an effective, reliable mental energizer. This is a hard segment for any product running up against Mind Lab Pro, because given the premium value of Mind Lab Pro’s nootropics, “Potency & Quality” is practically another proper noun for the product. 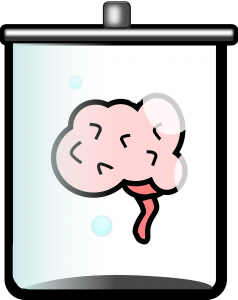 Thought experiment: If reality were projections from a brain in a jar, would the brain subsist on Mind Lab Pro or OptiMind? Plus when we take dosages into account, OptiMind shoots itself in the foot from the starting blocks by opting for proprietary blend dosages, whereas Mind Lab Pro is willing to show all of its individual dosages. Transparency is key in a nootropic review. Anything less is minus points. Mind Lab Pro is a High-Value, Multi-Purpose Stack. Having already reviewed both of these products separately, and having already given Mind Lab Pro a higher individual rating than OptiMind, it was no mystery to me which one had the higher chances of coming out of this review the “better” product. Yet, that can be said of just about any comparative review that features Mind Lab Pro. It’s simply that good, covering many diverse bases on brain health & cognition. Frankly, I’d need to see a pretty damn good nootropic stack to knock Mind Lab Pro off the top spot. OptiMind is Straight Brain Chemical Support. Regardless of Mind Lab Pro’s value, OptiMind is still a valuable product in its own right. The biggest selling point with this stack is its ability to clear brain fog, which effects everyone from time to time, but gets even more prevalant with age. One aspect of this formula that I’m not too particularly fond of, but can still appreciate, is OptiMind’s caffeine content. This easy addition immediately qualifies the formula as an immensely healthier coffee alternative for those trying to kick the habit. Or even for those who like a good buzz while getting their mental work done. Mind Lab Pro covers more for less cost. That observation alone is almost all you need to know here. Taking into account that Mind Lab Pro also accomplishes what OptiMind seeks to do and then some should also be your final selling point. Even so, I won’t judge if you opt for OptiMind. The mix of caffeine & quality nootropics is valuable in its own right, and there’s something to be said about mindfully choosing when & where to utilizing the power of caffeine. Having said that, Mind Lab Pro is still my recommendation here for its all around support on brain structure & function. With nootropics so good, caffeine is mere child’s play. Do you think it would be beneficial to stack these two together? IS ther anything stronger or more effective?